It’s National Chocolate Week, and people have been making delectable chocolate concoctions all week. Have you been doing your part? 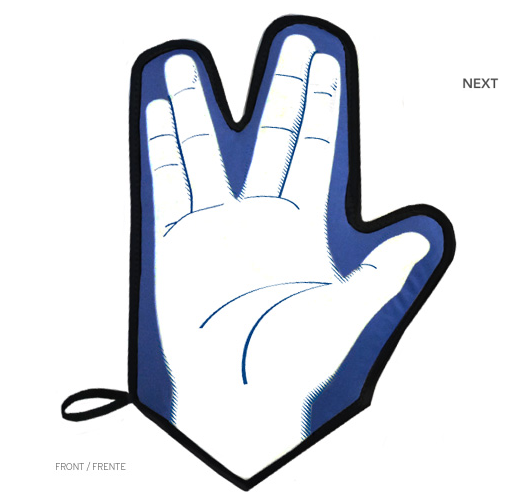 If you are – or think you are – an ace in the kitchen, and you also cannot get enough of Spock and the rest of the Star Trek crew, then here is something that you ought to add to your (kitchen utensils/tools) arsenal: an oven mitt for Vulcans. 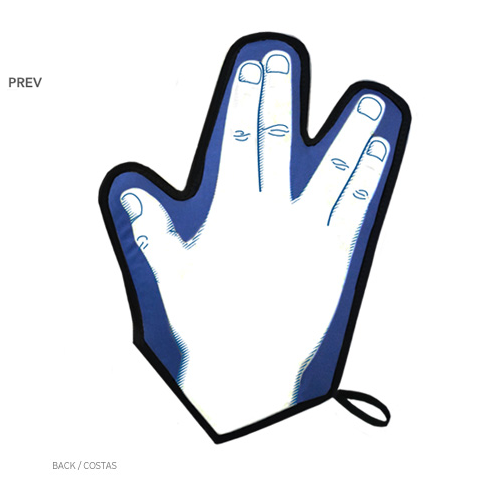 Now you may not be a real Vulcan and may only be aspiring to be one, but practically everyone can form the Vulcan salute anyway. The mitt is heat-safe and is made of neoprene, so you can be sure that your precious hands are kept safe while you do what you do in the kitchen. Bad news for lefties – they only mitts that fit the right hand! Still, I am sure you can manage to use this. This is the front view. The back of the mitt. Here’s one last look at the mitt.